Both the File Ages Chart and the Main Chart can be copied to clipboard so they can later pasted into other applications. To do this, you can either select an appropriate item from the "Edit" main menu, or click on the clipboard icon on the toolbar of a corresponding window. Note that the copied image does not have to have the same dimensions as the chart being displayed, and can be made larger or smaller according to your preferences. Width: The desired width of the chart to be copied to the clipboard. By default this is filled in with the currently displayed chart's window width. Height: The desired height of the chart to be copied to the clipboard. By default this is filled in with the currently displayed chart's window height. 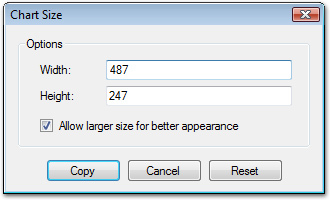 Allow Larger Size: If checked, the chart might be larger than the dimensions specified in the width and height fields. This will happen if the dimensions are too small and would compromise the look of the chart and the spacing of its elements. However, if you want exact dimensions, uncheck this box to force the chart to be of the desired size.